In a small saucepan, bring chicken broth to a boil. Add the orzo and bring to a boil again. Reduce heat, and boil, uncovered, for 9 to 10 minutes, stirring occasionally until most of the liquid is absorbed. Turn off heat. Drain any excess liquid. Stir in sun-dried tomatoes, feta cheese, salt, and pepper. Serve warm with Greek Chicken Roulades. Combine the olive tapanade, breadcrumbs, minced sun dried tomatoes, lemon zest, minced garlic, and dried oregano in a small bowl. Slice or pound the chicken breast halves to 1/4 inch thickness. Spread about 1/4 of the tapenade mixture on the chicken breast halves. Roll up and secure chicken roulades with toothpicks. Repeat with remaining 3 chicken breast halves. In a large non-stick skillet, heat olive oil over medium high heat. Sear the rolls of chicken about 3 or 4 minutes each side until golden brown. Remove the chicken to a platter. Saute the minced shallots in the same pan you cooked the chicken in for about 2 minutes. Add the white wine. Cook for a few minutes until the wine has reduced by about half. Add the chicken broth and the chicken rolls back into the pan along with the chopped Kalamata olives. Bring to a boil. Reduce the heat to low. Cover, and cook for about 10 minutes. Remove the chicken roulades to a clean platter. In a small bowl, combine the lemon juice and cornstarch and stir to a slurry. Add to the sauce in the pan and whisk in. Cook to thicken. Remove toothpicks and cut the chicken rolls crosswise to show the filling. Serve with Creamy Orzo and the white wine sauce. 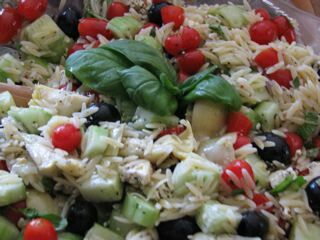 Categories: Ethnic, Ethnic - Greek, Main Dish, Main Dish - Chicken | Tags: Creamy Orzo, Cuisine at Home, Greek Chicken Roulades | Permalink. I was searching for a good Tzatsiki sauce to go with my Gyro recipe. My friend Sherilyn shared this recipe with me. Categories: Ethnic, Ethnic - Greek, Sauces | Permalink. I recently had breaded goat cheese slices in a salad at a restaurant. After I researched the process, I discovered that they are so easy to make. I decided to make them last weekend when our friends Mike and Anneke came to visit us with their children. We do not get to see them very frequently, so our time with them was sweet. I decided that since I had goat cheese, that I would try this new technique. It is super easy to make. The hardest part is slicing the goat cheese as it has a tendency to crumble like Feta does. One site recommended using dental floss, but since I only had mint flavor, I passed and used a sharp knife which worked out okay. These can be made ahead and then added to your salad later – they would also be even more fantastic warmed a little just before serving. 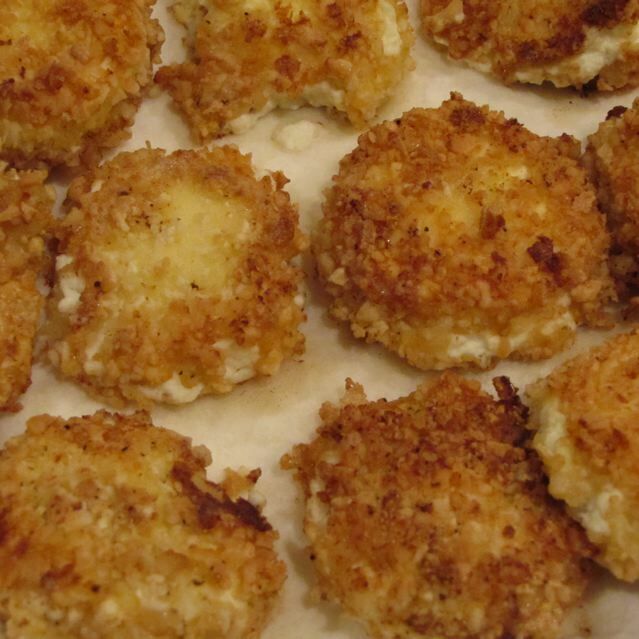 Dip the goat cheese rounds into the egg and then coat in the Panko breading (Japanese style bread crumbs that you should be able to locate at your well stocked grocery store in the International isle). Melt the butter with the olive oil in a small non stick skillet over medium high heat and fry the breaded goat cheese on both sides until golden brown. Remove to a paper towel and refrigerate until dinner time if making ahead – otherwise just add to the salad and eat. It is a very nice addition for a quick change. Categories: Ethnic - Greek, Side Dish - Salad, Side Dishes | Permalink. I was recently looking through my very first cookbook that I bought for myself. I was a Freshman in College then – and the Betty Crocker Cookbook was just the beginning of a growing passion. I found a recipe for Gyros in the cookbook and I hesitate to try new recipes on my family – my two girls were off to winter camp with their church youth group – and the only child remaining was my adventurous eater… so I stopped at Trader Joe’s and picked up a few pita bread pockets. I looked for ground lamb, but all they had was ground beef and it was an acceptable substitute. I also picked up some crumbled seasoned Feta cheese (though not in the original recipe) and it took the Gyro to the next flavor level. Yum! Mix first 8 ingredients together. Form into 8 small meat patties. Heat a skillet and add oil. Cook the meat over medium heat, turning frequently until meat is cooked. About 10-12 minutes. 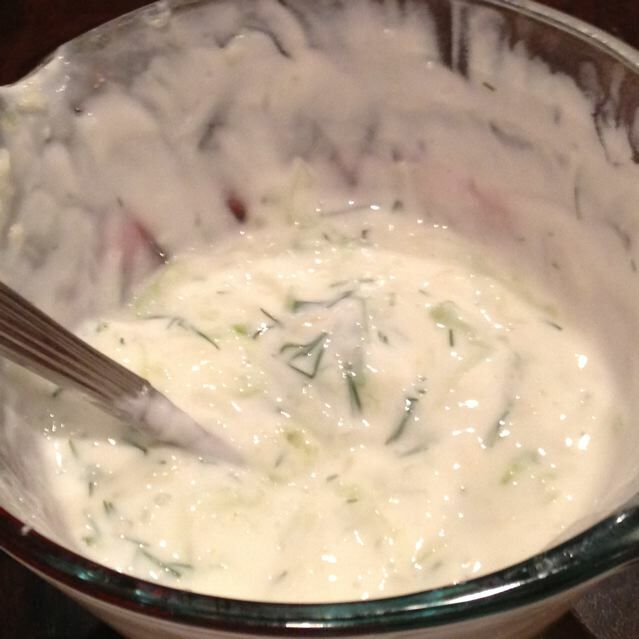 While the meat is cooking, combine the yogurt, mint, sugar and cucumber. Stir to combine. 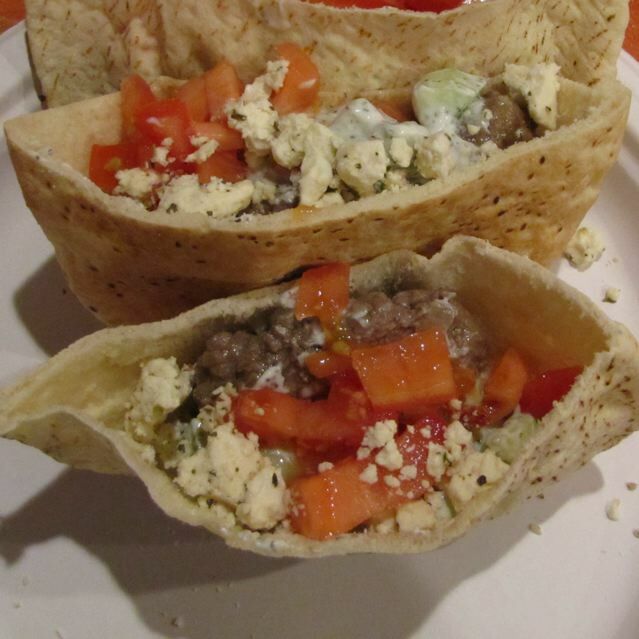 Open the pocket of each half of pita bread and put one meat patty inside. Top with a heaping spoon full with the cucumber sauce, diced tomatoes and about 1 Tbsp feta cheese in each pocket. 2 halves equal 1 serving. Categories: Ethnic, Ethnic - Greek, Main Dish, Main Dish - Beef, Sandwiches | Tags: Greek Gyros, Gyros, Pita Bread sandwich | Permalink. Strange name I know, it’s Greek and is a wonderful Lemon Chicken and Rice Soup. I went to a ladies night out and a friend brought this soup to the event. I went back for thirds and then took some home with me to share with my husband. Delicious! My kids all love it too and it is a frequent request now. I make it about every other week now. The recipe is from Cat Cora on the Food Network. I made a few changes to suit my family’s tastes. Just today my daughter announced that every Restaurant should have this recipe and serve it because she would order it every time! It really is that good. Do try it! Place the chicken in a large pot with 2 quarts cold water, enough to cover the chicken. Bring to a boil and reduce heat to low, skimming when necessary. In a separate pan, heat 2 tablespoons of olive oil and add the onions. Sweat the onions until clear. Set aside. When chicken is cooked through, remove from the broth. Let the chicken cool and pull the meat from the bones. Dice into large cubes. Set aside. Add the onion, bay leaves, leek, and carrot to the broth and simmer for 1 hour. When finished, remove the carrot and leek from the broth and add the rice. Bring to a boil and then turn heat to medium high to simmer until the rice is cooked to al dente, about 30 minutes. Add the chicken back into the broth. Add more water if needed. In a small bowl beat the eggs and lemon juice together. Pour 2 cups of broth slowly into the bowl of egg and lemon, whisking continuously. Once all the broth is incorporated, add the mixture into the pot of chicken soup and stir to blend well throughout. Season with salt and pepper. Serve hot. After I remove the carrots and leeks I chop the carrots into small pieces (last time I even squeezed them through my potato ricer) I add the carrots back into the soup with the chicken. I do not add onions, my kids don’t care for the texture, but I do let them simmer in the broth with the leeks and carrots, but do not add them to the final product. Very very yummy and fairly easy to make! Do go out and buy some Aborio rice, it is perfect for this soup. 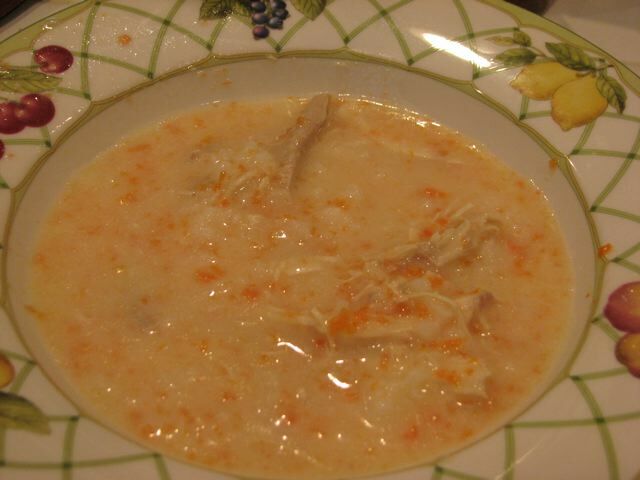 Categories: Cat Cora Recipe, Ethnic, Ethnic - Greek, Main Dish - Chicken, Main Dish - Soups, Top Picks | Tags: Avgolemono Soup, Chicken Rice Soup, Comfort Food, Food, Greek Soup, Recipes, Soup | Permalink.